Today we meet Carlo Quaglia who tells us the history of his dairy, located in Scarnafigi but initially set up in the valley where the “Grana” river flows, between the Alps and the Langhe. 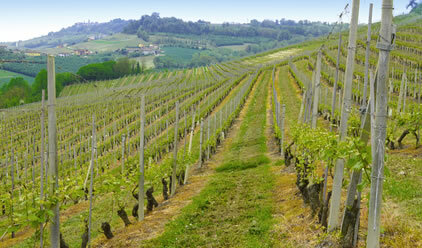 An area which, besides the production of various PDO cheeses, also boasts excellent wines and an abundance of hazelnuts. In this dairy, in addition to Grana Padano, four generations of cheesemakers have been producing Piedmont PDO cheeses, including Bra Tenero, Bra Duro, Toma and Raschera, a range of typical local products with different characteristics that meet the needs of all consumers. All Caseificio Quaglia products are PDO certified, made in accordance with strict production specifications and with milk delivered from neighbouring municipalities to ensure maximum traceability. The history of the dairy and that of Grana Padano have long been interwoven through all the changes that have taken place over the years. From the white Piedmontese cattle breed that produced 2-2.5 tonnes of milk a year to the Friesian cow, which produces 15 tonnes of milk with different characteristics, resulting in changes in cheese production. From the collection of warm milk in churns to the collection of cold milk in tanks. From the skimming done in traditional tanks to computerized vats with a tap from which the milk is drained at different times so that, every morning, the milk is already skimmed to the right level and has the right fat content. There has also been a change in the role of the cheesemaker: in the past he bore all the responsibility for how the cheese turned out, while today he is supported by technology, thus creating a link between tradition and innovation. In addition to the dairy, the Quaglia family also runs a pig farm, a bit like people used to do in the old days. And in this case, too, we’re talking about a PDO product because their hind legs are sold to make delicious Prosciutto di San Daniele ham. 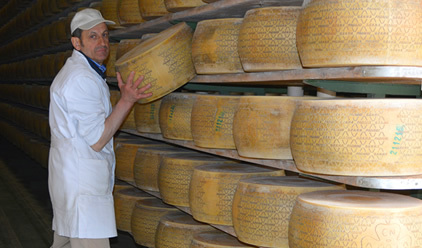 Our thanks to Carlo Quaglia for sharing with us a fascinating bit of the history of our cheese!